Livestream Q&A call recording for October 20th, 2018. Sam Ovens:	All right. I can see a couple of people jumping on here. Just let me know in the comments box if you can see my video and hear my audio. Just to make sure we're got everything working correctly. I can see we've got Jennifer Lee, Jeremy [Freidland], Joshua Westover, Brendon [Morenen], [Jeven] Woods. Welcome. Cool, thanks Joshua. Looks like we've got everything working. So, if it's your first time on one of these calls how they go is I do one of these every Saturday. We go from 3:00 p.m. till 5:00 p.m. Eastern time, that's the time in New York. I recommend putting it in your calendars so you don't forget. And I do them pretty much every Saturday. It's generally three out of four Saturdays. So 75% of the time. And I usually let you know ahead of time if we're not doing one. Sam Ovens:	And how they go is you just ask a question and that questions box to the right hand side or the comment box, and I'll answer them in the order that they're asked. So I'll get started here with Jennifer Lee's question. She said, "On your call with [Alberto] he said you outlined why an eight week training program is better than twelve weeks from a psychological standpoint. Can you share your thoughts on why that is." Sam Ovens:	So, sure. Well if you could have it in eight weeks or if you could have it in twelve what one would you prefer. You know, if given two options, slow or fast, you'll generally choose the faster one, and that's why. I mean, you want to try and compress it down as fast as it possibly can be done. I mean, if Consulting Accelerator could be done in a minutes I'd do it in a minutes. But I haven't figured out how to do that yet. And so that's why. You don't want to make it long for the sake of long. It needs to be as long as it needs to be so that the person can achieve the result. But it should be as short as possible. Sam Ovens:	So Jevon Woods says, "Sam, there are two questions I didn't want to ask for a long time, and I'm not quite there yet, but I'm really curious to know the answers so I have to ask, especially as I'm starting to progress and see great success. One, do you think once we transition from something like a coaching business to a course that it can become so successful that it eventually becomes common knowledge over time and ceases to exist?" Sam Ovens:	Yeah, I mean, this is a rational fear. You're worrying about something so far interesting the future. What you're doing here is you're thinking, "Well, if I do start a course, which I haven't done it, and then ... So if I do start a course and that course is really successful and not just really successful but so successful that like the whole world does it, then what would happen then." And you're worrying about what would happen then. Like, first of all you got to start a course. Second of all you've got to make it successful, which is one thing. And then to make it that successful. I mean, that's very hard to do, and if that did happen you'd be happy and successful anyways, so I mean it wouldn't matter. Like this is just a totally irrational fear. Sam Ovens:	And then you said, "For example my niche, dating for men, if my product becomes the best in the world and delivers truth and got the best results for men wouldn't this eventually become common knowledge for the average guy over time over a number of years and then people wouldn't need it?" Not true. I mean, they're meditating. Meditating is like sitting down, closing your eyes and thinking about nothing and just breathing. But yet there's bloody businesses out there that teach you how to meditate, and it's just because it is ... Just because you found a way to do it doesn't mean that people will always remember that way. Sam Ovens:	I mean, look at health and diet and exercise. If you want to lose weight and be healthy you've just got to get enough sleep, stay hydrated, eat good food and exercise. That's it. But yet, there's massive industry out there trying to sell you a like a new type of shoe or a Nike running app or all sorts of things. Different gems. I mean, the simple stuff is always there but there is never a time when people just see it. That would require all humans to be rational, which they are not. Sam Ovens:	[Naylor] says, "Hi Sam, I position myself as a confidence and success coach. My offer and message is I help women unlock their inner confidence by working on their self-esteem, body image and self confidence. I have my program outlined for my confidence booster program but no client yet in two strategy session calls. I am an industrial psychologist specializing in high performance behavior at work. I got one client accidentally by adding value in helping him. My question: how can merge these two into a successful and unique offer so that I can stand out from the crowd?" Sam Ovens:	All right. Let me unpack this. Yeah, so what you need to do here is you need to do more strategy session calls, because you've done two strategy session calls and you have no clients. That is very easy to do. I could do two strategy session calls and get no clients. It happens all the time. So what you need to do is do more strategy session calls. Honestly, the answers will come to you as you do more calls. You're not going to figure out the answers just by sitting still and thinking out into the future. It will come to you and you will figure out how to merge it. Sam Ovens:	So Jevon Woods says, "How do you deal with your competition in your field considering they could very well use your business advice or course and information and implement it? For example, if I'm the best in the world at what I do for helping men attract the type of relationships they want, couldn't my competition just take my information and compete against me with it? How do you deal with this?" Sam Ovens:	Yeah, well, this is a good question. And like anyone can read a book by like let's say Michael Jordan. Doesn't make them Michael Jordan. You can learn the method and you can learn the information but it doesn't make you the same. Like it's practice that makes you good, not information. I mean, information tells you what to do but it's the doing of it that makes you good. So yes, a competitor could just take your information. Would they be better than you at it? Only if they practiced more. Only if they knew how to apply it in the real world better than you. It's practice that makes a competitor dangerous. Not information. Sam Ovens:	Brandon [Molran] says, "I'm having trouble with prioritizing. Does it make more sense to focus on getting new students or to make my training program better for the existing students?" Sam Ovens:	That's a good question. I would ... If you're having this problem right now I would do both. So I would do some, like half the week making the program better, half the week selling more students in. Because sometimes the answer isn't one or the other, because you can't just binary decide those things out. For example, making your program way better might take a lot of time. It might take more than a month, and in order to do that you can't just completely stop selling and completely stop marketing for an entire month. Or maybe you can, but you probably wouldn't want to. So I would do both. Split your week out and then do it like that. Sam Ovens:	Michael [Espaza] says, "Hey Sam. What's your routine in the morning?" Sam Ovens:	So, I wake up at 6:50 in the morning and then I go to the gym at 7:00 a.m. and I do a workout for about an hour. Then at 8:00 a.m. I have a shower, get ready and everything. Then at 8:30 ... Oh, and then I have my breakfast, which is just a smoothie, and that all happens in thirty minutes, so that's from 8:00 to 8:30. And then at 8:30 I do a meditation, which goes until 9:00. I do it for 20 minutes each morning. And then at 9:00 o'clock I start my workday. And then I work all the way through till 12:00, and then at 12:00 I have my lunch for half an hour. And then 12:30 all the way through till 3:30, and then there I have like a smoothie, like a break in the afternoon, just for like 15 minutes. Then back to work, and then I work all the way through till 7:00. Then I have dinner then for 30 minutes. Then at 7:30 I'll keep going till 9:00, and then at 9:00 o'clock till 9:30 I plan tomorrow today. So I map out the whole day. Sam Ovens:	Now, in between those blocks out there, that's where tasks will be put in, like I'll be working in between those chunks, but my day's structure is the same every day. And so I know, you know, it's just automatic. It just happens on autopilot. And then those little blocks, those spaces in between, that's where I can put work in. Like work towards projects. Sam Ovens:	[Raheesh] says, "Hey Sam, just done with week two. Very powerful." Awesome, good to hear. Sam Ovens:	Lauren Alexander says, "I'm trying to choose a niche. I know about the screen printing industry as I have worked in it for several years and feel confident in my abilities to seek them out, help them and build up clients fast, but I don't want to do that forever. However I'm eventually want to create a course that helps artists to make a living from their creations. I am an artist, but as I'm not currently making a living for myself as an artist I'd feel like a fraud if I tell people that I can help them and charge a lot for it, although I know I could figure it out eventually." Sam Ovens:	Yeah. So, this is a good question. And what I would do if I was you is I would figure out right now how to make a living from your creations as an artist. Because you're currently an artist. You're obviously passionate about it. You haven't out how to make a living from it. Figure that out. Then master it yourself first, get it to work, and then you can probably create a course showing other people how to do it. That is what I would do. Because the other one, you're looking at your skills and all of that, but like the screen printing thing. But this one here is more of your interest and your curiosity and your passion and in my experience and from watching like 20,000 people like go through training, it doesn't matter so much what your skills are. It matters what you're interested in. Because what you're interested in you will get good at, and you will acquire the skills, so I'd go with that one. Sam Ovens:	Joshua [Westover] says, "I took your suggestion last week and have started a YouTube channel for my niche, fear of flying. What would you say is my best approach for getting prospects and strategy sessions using YouTube? Maybe attaching a link to my fragmentation funnel in the description?" Sam Ovens:	Yeah, I think that could be a good idea. Like you could do that. Or you could just make it even more simple. You could just say, "Private message me if you want to chat." Because you're not going to have a huge amount of traffic, right. Funnels are good when you have quite a lot of traffic, but sometimes just direct messages can work well when you don't have a huge amount. Sam Ovens:	[Jawood] says, "I identified a big problem with tech recruiters which is being able to attract more candidates. My offer is to help them attract candidates consistently through improved market knowledge. A while ago you advised that I work with them to help them get clients with digital marketing to learn more about that niche. But this has been challenging because they are very skeptical and always demanding social proof, which made me doubt myself and my ability to help them. Between April and July I was able to only get 12 strategy sessions sending 25 messages every day. Should I explore the angle of being a recruiter myself to prove my approach works, since I'm more interested in the recruiting side rather than the digital marketing side?" Sam Ovens:	Yes, I do think you should do it yourself first. Absolutely. That's how you're going to learn. That's the only way you'll learn. So get in, get your hands dirty, figure it out, and then you can scale up that method and sell it to others. Sam Ovens:	Michael Espaza says, "Hey Sam, I'm in the mortgage business. Any advice on how you would generate customers?" Sam Ovens:	Yeah, I would just go through the program, Consulting Accelerator. It shows you exactly what I would do if I was you, step by step. So just go through that. Sam Ovens:	[Berkely] Robinson says, "Does Facebook optimize for days of the week or should I manually select days of the week? Helping eCom stores and the products sell hot SMTW and slow TFS." Sam Ovens:	Yeah, so Facebook doesn't necessarily optimize the days. Like if you advertise in your budget so like let's say 100 dollars a day. Facebook is just going to spend like that 100 dollars a day. It's trying to spend that budget across a 24 hour period. If one day ... If a Wednesday is better than a Monday it's not going to not spend anything on Monday and then spend it all on a Wednesday. It doesn't do that. You can set it up manually with dayparting so like you can part it to only run on specific days and things like that. But in my experience that just makes it worse. Like in my experience running ads you want to be consistent. Really really really consistent. And you want to have things running every day of the week and every hour of the day. And that's how you gain momentum. Sam Ovens:	So that's how it works. I would really be certain in your strategy here about only running it on specific days. Like I'd make sure you have some real data before you'd make a decision like that, because I'm pretty sure like you would make less money by only running it on those other days. Sam Ovens:	Brian [Zarusky] says, "Hey Sam. Is coaches and consultants expert niche enough or too broad?" Sam Ovens:	Too broad. That's a very broad one. Especially for standing out. Sam Ovens:	Mark [Gilday] says, "Here's my big question and it may not be appropriate to answer in this form, but I'm interested in [UpLevel] consulting, but do not want to take your time for the call unless it is in budget. What is the cost for the UpLevel consulting program?" Sam Ovens:	Sure, so I'll just copy in [Rhett] and Rhett. I just commented, "Here Rhett will just message him on Facebook. Just do a chat and just say you're interested and he'll help you out." Sam Ovens:	Now, where were we? Joshua Westover says, "I'm considering creating slides to help with presenting my one-on-one coaching for fear of flying. I'm thinking it will make it easier as it will guide me as well as show what I'm explaining more clearly with diagrams, etcetera. Would you recommend this at all?" Sam Ovens:	Yes. Creating slides can be a really good thing to do because it forces you to really like sharpen and hone and refine your concepts and your methods. And so a lot of people, they don't make slides. Like they won't make a [VSL], they won't ... and if they make a course they won't make any slides either. And what they prefer to do is just have like a whiteboard up or a flip chart pad thing with a pen and just kind of like draw and draw all over it. But those people do have very organized minds, and their thinking is horrific. It's chaos. And sure it's easier to do that. It's easier to stand in front of a board and just talk around in circles, and because [Meta] can draw some diagrams. But it doesn't really get the thinking clean. Forcing it into slides and words and like concepts and diagrams, that requires a lot more effort and it's harder and it's more painful but the outcome of it is clearer thinking and that's what makes a really good course. That's what makes an exceptional course. Sam Ovens:	Nick [Petroky] says, "Do you plan on ever becoming an American citizen?" Sam Ovens:	Haven't even thought about it, really, to be honest. I'm on my visa right now, and my visa lasts for quite a long time, so I was just going to stay on that and then see like when I get close to the end look at what the options are. But I don't really see much difference between being a citizen and being what I have now. Because you can still pretty much do the same things. Jackie says she is in week two and loving it. Awesome, glad to hear that. [Sterling Cully 00:21:13] says, "If we are doing health related coaching, who do we ask to do our market research?" Sam Ovens:	Well, who is your niche? You know, if you ... Like, say you're talking about health related coaching but who is the niche? Who is the person? Whoever the niche is you talk to them. That's who you do your research with. Sam Ovens:	[Dannielle Christine 00:21:37] says, "Do I really need to check Facebook ads every day if I set up rules that it doesn't go outside of my KPI and budget and cost per lead?" Sam Ovens:	Yes you do. Seriously. You can set up rules, but the thing is it can do weird stuff. And it has to be checked on. It's not a lot of work. It's just checking it once a day, reporting it, putting it into your spreadsheet, and then making adjustments. And one, you can't really automate that putting of it into spreadsheets. And someone will probably say, "Oh, I bet you can with like Zapier and all of this other crap." Yeah, I don't want to trust that. This thing is too important to put a Zapier thing together. Like I see so many entrepreneurs try to automate things that are crucially important and take not much time. For example, like the war map calendar which I give to people and get them to use. I saw some people like complaining. They're like, "Why isn't this war map automated? Why when it goes to the next day do I have to manually make that day yellow and manually cross out the other day?" Sam Ovens:	I was like, "That's about two clicks, and probably about three seconds." All right. You don't really need to automate two clicks in three seconds when you're probably like watching Netflix and hanging out on social media for like nine hours a day. Now, you do not want to get rid of and try to automate and outsource really critical things. Like you want to hold them close. There's some things that you always want to do yourself. And in the beginning up until you're making a lot of money the reporting of your key metrics and KPIs, especially from Facebook, is extremely important. Sam Ovens:	Nadine says, "Hi Sam. My niche is helping Ecuador expats to become fluent in Spanish. I am hoping you could help me come up with a data point for the sales script. Currently I'm asking how much time they spend per day speaking Spanish verse how much time they want to spend speaking it will. I'm not sure this is the best way to measure their current level and their desired level so I'd appreciate some feedback." Sam Ovens:	Sure. Well, you're talking about something, that what you're helping people do is you're helping people become fluent in Spanish, right. So what they're going to have in their mind is a view of what being fluent in Spanish is. And you need them to tell you that. So they might think of like going to a dinner party and being able to speak it the whole time, or being able to walk anywhere in the country or town or whatever and be able to speak it fluently. Like, you want them to tell you what they believe is the fluent situation. And that's not so much going to be a metric of number of hours. It's going to be a way they described it. It'll be an image that they are describing to you that they have in their mind. Sam Ovens:	And then the current situation is just the current state of how things are. So what are they doing right now? It's an image. It's like, you know, they only speak Spanish to some people. Maybe nobody knows they're even learning how to speak Spanish because they're too embarrassed. Like don't worry so much about trying to get a number for it. Just try to get the image from their mind. Sam Ovens:	[Raheev] says, "Question, how would consulting.com help me with a done for you program for software development kind of work? I just completed week two so if it's later on don't worry." Yeah, I mean, it will show you how to do that. I mean, it's pretty universal. It doesn't matter what you're selling, whether it's done for you stuff that's very technical or just life coaching or ... It's all the same thing. You're basically selling a solution to a problem and you sell it the same way and the methods are universal. So don't worry about it. You'll find it. Sam Ovens:	Paul [Eastern] says, "I've been in the digital space for a few years, and I've been approached by two potential clients based on my background. The work they want is outside the area I want to go. I help Amazon sellers build a profitable off-Amazon Shopify store. I could help with consulting. My concern is it's off the direction I want to go." Sam Ovens:	Yes, that's a good question. It depends. If you don't need the work or the money, say no. If you are in survival mode and you need it then you should probably take it. So this is what you do. But if you don't need the money and you're fine as you are trying to work with your other thing, say no to the money, leave it on the table. Like if you want to get really good at something and grow to the next level you have to learn to say no to money. And I do this all the time. People want to like, people want private days consulting and want to buy hour long phone calls and things, and we just say no to everyone all the time. And it's just a default no. No, no, no, no. Even if someone was like, "I'll give you a million dollars for this." No. You have to get good at saying no. Sam Ovens:	Now, in the early stages when you don't have any money and you're kind of survival mode it's a different story. You kind of have to do some stuff that isn't ideal because that's the journey. You're building up experience and knowledge and also some money so that you don't have to do things that you don't want to do. Sam Ovens:	Ian Edwards says, "I see you're really comfortable putting yourself out there to deliver your message. Was it always that way or did you ever struggle with exposing yourself. If so any advice on overcoming the fear of exposure?" Sam Ovens:	I don't really think I'm ... I think at the beginning it was actually quite hard. Like because you care a lot about what other people think of you, when a normal person does. So if you're a normal socially conditioned human being, which you are if you've grown up in a civilization, then you're very very conditioned to social concepts. So like what your group and social circles and everyone thinks about you. And you're always thinking, "What do they think about me." Which is kind of weird. And it's of huge importance to people. And as soon as you start doing entrepreneurship and you have to put yourself out there like that, yeah, it does play havoc with you quite a lot because people start calling you names and everything and you're used to caring about that a lot, and now it's happening excessively and it's kind of challenging. But you don't really have any other choice, and it doesn't really matter anyway. If you analyze it and think about it, who cares what some random person thinks about you. That's kind of stupid. And when you really think about it, who cares about what anyone thinks about you. The only thing that really matters is what you think about yourself. And so I can say that it'll be hard for everyone when they first start doing it, but that shouldn't stop you from doing it. And then with time and just experience and exposure you'll just forget about it and it'll just be nothing to you. Like I don't even care about it anymore at all. Sam Ovens:	Josh says, "How do you get around or handle this on strategy sessions? I don't think my customers are on Facebook so the ads won't work. It's pissed me off so much that I've started bluntly asking, "Is that fact or opinion?" And they start spitting feathers blurting out all sorts of crap. But I don't know how to get around it and it comes up on every strategy session." Sam Ovens:	Sure. Well, what is your niche? Can you just type a reply to your message here and just say what your niche is. Because there's a good way to get around it, but it kind of depends on the niche. Let me just see if you reply with what your niche is. If you just reply to your original comment ... Yeah, so I can't see it here, but as soon as you tell me what your niche is I'll tell you how to handle this one. And then it'll make sense for everyone else too if they need to handle this one. There's a good way to respond to it. Sam Ovens:	Mark Chapman says, "Is it possible to have two types of clients for one niche without having two sales processes? I help top to middle managers achieve strong results and build better organizations." Yes. So really that's the same thing. Like there's never going to be an exact carbon copy of this person who is our niche. Every individual is going to be slightly different but they all fall within the same kind of category. And so this is just managers really, top to middle management. I mean, it's the same sort of thing. So that is really just treat them the same. There might be some nuances which you dynamically adapt to in each conversation, but that's it. Sam Ovens:	Lee Parker says, "I have a list of 18,000 people in my niche. Is it important to use a live webinar for the list farming method, or is an automated webinar just as effective if use [inaudible] webinar to have them sign up with the webinar at a specific time? Sam Ovens:	If you're doing a list farming method to your existing list a live webinar would probably work better. When it comes to running paid traffic consistently to something over a long period of time you want to use an automated. But for a one-off farming event do it live webinar. Sam Ovens:	Joshua Westover says, "That eye at the start of your webinar, is it from Alien Covenant? I'm still not sure where the [C] logo is from" Yeah, that's where I got that eye from. And the C logo, well, I'll let you keep trying to find where that came from. Sam Ovens:	[Sterling Cully 00:34:14] says, "For men who experience impotence because of work stress, they perk up when I say that it can be solved, but it's still just a symptom of a tough business situation. Should I stick with the health portion or expand to helping with business strategy which I definitely could?" Sam Ovens:	Yeah. I mean, you've got to be careful here because if you're saying that you help people with mindset and health and all of that then you should really stay on that stuff. And then if you start spotting tactical problems in somebody's business it kind of gets murky if you go over and start helping them with all of that too. Because I'm just trying to imagine what that would look like if you did both. Like you're really good at everything in business and you can help these people solve all of these problems in their business, but you also help them with their health and fitness and everything. I'm just trying to understand what that would look like. Sam Ovens:	It makes more sense doing it from the business side and also helping with the health than it does from the health side and also helping with the business. And I would lead with whatever one is more important to them. Like what do they care about more? The business result or the health result. And what one you want to focus on more. Do you want to help people with their business or with their health? I would start by focusing on one of those, and they might include a little bit of stuff on the peripheral which helps. Like if you're doing business it might include a small amount of stuff that helps with the health. And if you're doing health it might include a small amount of stuff that helps with the business. But I wouldn't try and nail both. They're two big things on their own and they're very different. Ellen [Cone] says, "Hey Sam. My first client was [Done For You 00:36:35] to a CEO of a software in the automotive industry to help them get more clients. I charge 6K per month. Now I want to help sales engineers increase their sales in auto industry. My niche is helping engineers who are in sales increase sales. I wanted to charge one time price and eventually create a program. How much can I charge for [Done With You 00:36:59]? I mean, you can charge whatever you want. I think you've got to go through the process and in the Consulting Accelerator program in week one, which is around crafting your offer, coming up with the pricing and the messaging, really evaluating how much value it adds to them, and what it would cost them to not solve the problem. Really evaluate it like that and then come up with your pricing based on value. Sam Ovens:	[Jawood Pillar 00:37:40] says, "What is the four ... " [Jawood] says, "What is the four pillar framework you mentioned once in week two training, The Alchemy of Self, when you were describing yourself when you first got started, you said helped people build successful business. Sam Ovens:	Yeah, that was just this thing I came up with like a while ago. I honestly don't ... No, I might be able to remember what it was. Yeah, it's pretty much what I put in like Consulting Accelerator in the start of the ... That pinup in like week one, module one. And I'm pretty sure it's like business fundamentals, like niche offer, all of that. And then mindset and then the sales process. Like a method to attract clients, and then a sales process to convert clients. It's like these four things. Foundations, mindset, attraction, conversion. Pretty sure that was the four pillars. Sam Ovens:	Robin Thompson says, "Is using an online survey a good way to socialize and test your message?" Sam Ovens:	I mean, nowhere near as just talking to people to be honest. Talking to people is the ultimate way to learn about the market and test your message. Sam Ovens:	Lauren Alexander says, "Since there are so many ways that artists can actually make money, commissions, licensing, selling originals, apparel, etcetera, do you think I should focus on one aspect so my [NVO] isn't a million things, or should it be a combination of all of those things including passive income for artists?" Sam Ovens:	It should be the thing that works the best. Now not all of those things are going to work well. And you don't know like which one works well because you haven't made any one of them work. So you need to do your research, dig into it. Start finding the people. If I was you, I would look at the artists that have figured out how to make money off of their work and I would research the hell out of those people and then I would see what they're doing and spot the patterns and similarities between all of them. And find who's doing it the best. And then boil that down to the simplest terms and try and do that yourself, get it to work for yourself. And then really hone and refine it. And then once you've mastered that then you can probably start providing that as a course to other artists. Sam Ovens:	Roberta says, "My services are aimed at helping companies implement corporate social responsibility. Should I focus on the benefits of the individuals, finding a sense of purpose, etcetera, or the benefits for the company, cost savings, legal compliance, employee attraction, etcetera?" Sam Ovens:	Yeah. So I think what you need to do is you need to figure out who is your niche. Is it the owners and the executives and the managers of corporations, or is it the employees within the corporation? Like, which one is your niche? Which one are you targeting? And then what is their problem? And then your solution is a solution to that problem for that group of people and that is who you should make your message all about. Sam Ovens:	[Jawood] says, "Does Ashley have bad habits which you think affect her badly? How do you deal with a partner who has bad destructive habits such as addiction to social media, and how do you advise them to quit that?" Sam Ovens:	Yes, I mean, I don't really think Ashley has that. I mean, Ashley likes to look on Instagram but she doesn't really use Facebook or any other social networks. And also I don't think her using Instagram is that bad because she hasn't put like these goals and responsibilities on her that require her to not have to do that. So she's happy and fine with it. Like I only think social media and that stuff is bad when it's stopping you from actually achieving what you want. And so I try not to get into other people's business unless it's very clear to me that they don't want to be doing it and they just don't know how to stop it. That's when I will kind of intervene. But otherwise I just let people kind of be themself and do whatever they want. Unless they come to me asking for advice. Then it would be different, right. Then I would tell people like what I do in Accelerator. I'd start getting ruthless with people and tell them to strip away everything. But if they don't ever ask me for my advice I don't really give it. Sam Ovens:	Dan says, "I'm in the hybrid battery niche. I have many ways I can head with my knowledge in this industry. I have gotten a client where I consult him on his business. The other side is sales of hybrid vehicles to dealerships. I have also gotten interest from people who want to get into the business of rebuilding hybrid batteries and selling them. This breaks down into three parts. One, people that are in the business already, low hanging fruit. Two, people getting into the industry. And three, working on a sales course. What would your advice be on going towards this industry?" Sam Ovens:	That's a good question. It sounds like a cool niche, first of all. And it's definitely a sunrise industry with the way cars are kind of evolving. And I would start with the people that are in the business already. That's the best place to start, because you want to master that and conquer that one first. And then once you've exhausted that one, which won't happen for like a year or more, more like two years, then you can start focusing on the other one as well. So you're helping people in the industry get better, and then you're helping people join the industry and start. And then once they've started you can help them get better too. And you can [inaudible] them up through both of your things. Sam Ovens:	Jawood says, "Someone has once asked you about resources and prototype wire frames for SnapInspect which you did using Keynotopia. I had a quick look online but only found the article from them. Can you please provide the actual Keynotopia files which you gave to one of the students already?" Sam Ovens:	I didn't give them the files, like the actual Keynotopia files. I just showed them the video on YouTube. So if you go to YouTube and you search for SnapInspect and then you look at the SnapInspect YouTube channel and you find the very first video that was ever uploaded on that thing, that'll be the one of me clicking around on my old iPhone showing a prototype of the app. That's what I gave the person. I didn't give them the actual PDF files. Sam Ovens:	Mark Chapman says, "In my [Done For You 00:45:52] offer to help top and middle managers achieve strong results and build better organizations so far I'm getting solid and positive feedbacks from my existing clients. Two clients over one billion annual turnover for each of them, 500 employees plus. I'm just struggling on the sales part in my value video, plus doubting that my [P2P] approach works for the B2B approach if I target HR managers instead of managers." Yeah. So here you've just got to know who you're talking to. So who is going to be watching the value video. Is it more likely to be like an HR manager or is it more likely to be an executive? Like who are the different types of people that are going to interact with the video? You want to list them down. Like who are the main four people or the main three people or two people? And then in your video you're going to talk to all of those people. So you don't have to do a different video to talk to all the different ones. You can talk to all of them in one video just by making sure that you follow the parallel stories all the way through. It's kind of an art to do it, but you can do it. And so you can say, "Are you an HR manager or an executive or someone else?" And then you can kind of mention and talk to all of them throughout the whole thing. That's how you do it. Josh [Dez], "I'm not passionate about my niche either. My passion lies actually [DM], funnels, copywriting, etcetera. So I'm not overly sure who I fully want to work with. I've figured out the system I need to get those clients results. But the industry itself, small business lending. So I'm not overly sure what to do and who to work with." Sam Ovens:	Yeah. So it sounds like your problem probably stems from this, not actually being passionate about your niche, more so than any other thing. And so I would probably fix that. I would take a little bit of time to think, who do you really want to work with? What are you really curious and passionate about? And pick that niche. Jawood says, "Someone has once asked you ..." I've already answered that. Sam Ovens:	Jennifer Lee says, "Regarding affirmations, what advice can you provide so we compile the best affirmations possible for our specific situation. I'm leveraging my new character worksheet and other worksheets in week two." Sam Ovens:	Sure, so what you want to do is you want to look at your current self, like who you are now and everything and all of your characteristics. Then you want to look at your future self, like your new character and all of those characteristics about them. And then you want to spot the differences. What weaknesses do you have now that you need to fix? And then what strengths do you want in the future that you don't have now? Now, your affirmations are going to be building those things. Your affirmations are going to directly relate to fixing bad habits and bad traits and building and acquiring and strengthening new desired traits. That is their purpose. 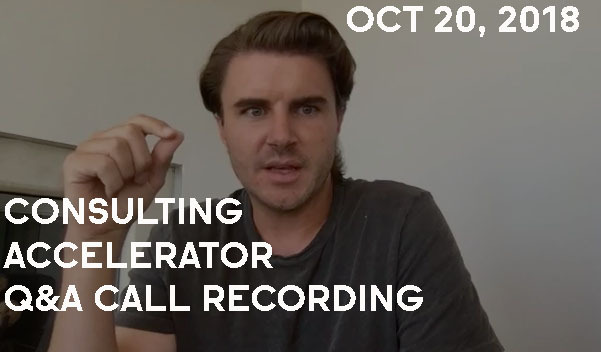 Sam Ovens:	Isaac says, "I need a bit of help referring friends to the Consulting Accelerator. What would be the most effective steps to convince the skeptics and or [inaudible] into people that buy CA program?" Sam Ovens:	Honestly, I'd just get them to try it. Like give them the free trial. Like say, "Look, just try it and see. I mean, I can explain it to you all day but you might as well just look at it." I'd do that and maybe show them like inside the Facebook group at all that ring the bell all the time, just again and again and again and again. Those two should be quite powerful. Sam Ovens:	[Ricardo] says, "Can you tell us about the biggest objection you overcame when you were consulting yourself?" I don't think there was one big objection really, to be honest that ... The main one I would say that came up is more just ... It's more just like decisiveness and sense of urgency and just making a decision. Like it's very hard to get people to do this. And a lot of people, they might need what you have, obviously blatantly they need it. And they have the money, and you've explained it fully. And you've covered all of their questions and everything. But they still just don't pull the damn trigger. They're like, "Oh, I don't know, I have to think about it." Or, "I just need a bit more time to think about it." That sort of crap. That is the stuff that lies at the heart of ... Sam Ovens:	(silence) Is it still working? My whole computer just pretty much shut. Like Facebook's going nuts. Reload site.